In 2013 we introduced a line of notecards (wonderful gifts!) featuring the floral photography of our founder. The cards are 4.25 x 5.5", printed in the USA on top quality heavy stock, with white envelopes. Consider the gift packs as corporate and personal gifts and a gift to yourself. We encourage the creativity of handwriting your own personal message in a notecard!) Visit our notecards gift site www.myfloralnotecards for complete details. Successful Website Marketing - 144 pages packed with worksheets, checklists, examples, articles and tips for promoting a small business or consultant website. 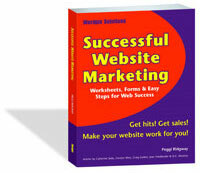 Contains articles by Internet advertising consultant Catherine Seda, Marketing Consultant Joan Friedman and others. Contact Wordpix to order at $15 (includes shipping) by check or credit card. 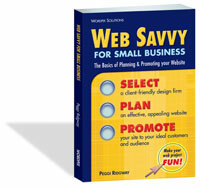 Web Savvy for Small Business E-book ($11 plus 7.75% tax for California residents) - by Peggi Ridgway. This 135 page PDF download (requires Adobe Acrobat Reader) helps entrepreneurs and small business owners plan and promote a website with confidence. How do you find a web designer? Further, what questions do you ask potential web designers? Web hosting companies? What's the best design for your website and what must you do to attract search engines to your site? Contact Wordpix to order your copy. Questions about Wordpix Services or Products? Call us at (800) 200-1101 during business hours (Pacific time) or email info@wordpix.com. Enjoy your tour through our web portfolio. Contact Wordpix for more information.